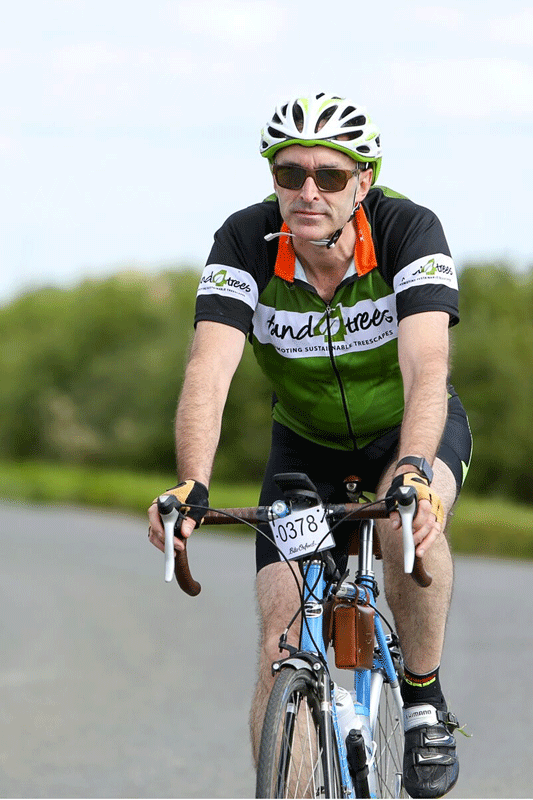 Fund4Trees was founded by Russell Ball in 2011, who organised the inaugural Ride for Research event. Three fellow 2011 riders—Mick Boddy, Martin Gammie and Gabriel Hemery—joined with him to help create a new organisation in 2012. The four became the organisation’s first trustees, and in 2017 they were joined by a fifth trustee Tracy Clarke. In 2018 we appointed Robert Penn as our first Patron. Fund4Trees, Trustees and Patron. Left to right: Russell Ball, Martin Gammie, Tracy Clarke, Mick Boddy, Robert Penn (Patron), and Gabriel Hemery. Russell Ball BSc (Hons. ), P.G. Dip. LM, CBiol., MSB. From a very early age Russell’s had a keen interest in nature which led him to study botany, and it was while at university that he discovered the world of arboriculture – literally by picking up a “Tree Surgery” book at a local library. Since then he’s never looked back having been lucky enough to hold some key industry jobs: Executive Officer for both the London Tree Officers Association and International Society of Arboriculture (ISA) – European office. He also worked as a Tree Protection Officer for Harrow Council (London) and spent two years tree consulting in Madrid (Spain) where he researched how trees add value to property prices and was on the technical editing committee for the Spanish national standard for protecting trees on development sites: “NTJ 03E”. In 1996, he was voted Environmental Londoner of the Year and in the same year (jointly) won a Royal Horticultural Society (Chelsea Flower Show) silver-gilt medal for Rainforest Belize. Presently, he is consulting arborist working out of NW London and the President of the ISA UKI Chapter. As a Chartered Biologist his qualifications also include an honours degree in botany and a post graduate diploma in landscape management. Mick has been involved in forestry and arboriculture for over thirty five years and is a Registered Consultant of the Arboricultural Association and a Chartered Arboriculturist. His experience encompasses periods of employment within the state, private and local authority sectors, and Mick is currently a director Symbiosis Consulting Ltd, a specialist arboricultural consultancy practice he co-founded in 2000. The ISA Conference and associated Tour des Trees fundraising ride coming to England in 1998 provided Mick with the perfect opportunity to combine his passion for trees with one of his favourite pastimes – cycling. He was so inspired by the 1998 ride he subsequently rode in the 1999 New England, 2002 Washington and 2007 California tours, before a temporary change of allegiance in 2008, when rode the first Big Battlefield Bike Ride for the then fledgling Help for Heroes charity. However, there was an inevitability about Mick’s participation in the inaugural ‘Ride for Research’ in March 2011 and he is proud to be involved with founding of the Fund4Trees charity-to-be and generation of much needed finance for research into the manifold issues currently threatening our tree stock. Growing up on the country estate in Warwickshire, Martin developed a passion for the countryside, wildlife and especially for trees from a very early age and has had an affiliation with the world of forestry and related industries ever since. He has spent over 30 years working in the industry attaining a wealth of experience, credibility and qualifications. Having worked in both the public and private sectors in the UK and overseas, Martin currently holds the position of Director at Consulting with Trees Ltd. Promoting his industry and improving professionalism within it is at the heart of Martin’s work. Currently this includes working with the Trees and Design Action Group (TDAG) to develop and disseminate best practice guidance documents. In his previous role of Design and Environment Team Leader at South Oxfordshire Council he established the first Tree Warden scheme in Oxfordshire and was responsible for the launch of the South Oxfordshire Arboricultural Industry Forum. 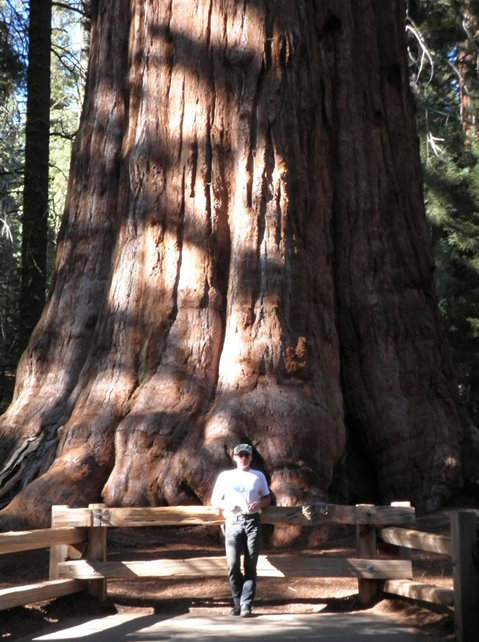 Gabriel is a passionate advocate for trees and forestry, and a prolific forest scientist. He co-founded and is currently Chief Executive of the Sylva Foundation. During 2011 with other prominent environmentalists he co-founded the ginger group Our Forests, providing a voice for the people of England concerning the future of the country’s forests. Gabriel writes a popular tree and forestry blog www.GabrielHemery.com. He is author of the award-winning book The New Sylva, published by Bloomsbury in 2014, and is working on several other book projects. Gabriel took part in the inaugural Ride for Research event in 2011. Tracy is a Registered Consultant of the Institute of Chartered Foresters, a Fellow of the Arboricultural Association, and elected Council member of the Institute of Chartered Foresters. Tracy has worked in the arboricultural industry for 20 years, working initially in Local Government as a tree and landscape officer. She has worked in the private sector in the latter part of her career and is now a Director for Tracy Clarke Tree Consultancy. Tracy took part in the inaugural Ride for Research event in 2011, and is really proud to be involved in Fund4Trees which she sees as a positive response to facilitate valued research for trees in the UK. In her spare time, Tracy enjoys racing BMX, cycling, crossfit, and going for long walks with her family and dogs. Robert Penn is a writer and broadcaster. His books include Woods: A Celebration published by the National Trust, The Man Who Made Things Out of Trees and the bestselling It’s All About the Bike. As a journalist, Robert writes for the Guardian, Observer and Financial Times. He has presented several TV documentaries including the BBC Four series Tales From the Wildwood. A keen cyclist, Robert has ridden a bicycle in over fifty countries on five continents. In his late-twenties, he gave up a career as a lawyer and spent three years cycling round the world. He lives with his family in a small woodland in the Black Mountains, South Wales, from where he runs a community woodland group. He joined Fund4Trees trustees on the 2017 London-to-Lincoln Charter Ride.